After their narrow 1-0 victory over Hoffenheim, Dortmund seemed to be at the beginning of a winning streak. In their most recent match against Hertha, however, Klopp’s side had to swallow a bitter loss and fell back to 16th place in the league table. It was a tied match especially in the first half and shortly before the break, former Dortmund player Julian Schieber scored the only goal of the match against his old club. After the break, Dortmund rolled up their sleeves and dominated the second half but without that stroke of luck which is eluding them at the moment. With the 1-0 defeat, Klopp’s side fell back in the table and need a victory against Wolfsburg. Klopp will miss playmaker Henrikh Mkhitaryan who is injured and was substituted in the 35th minute against the Wolves. The Wolves have only lost one of the last ten matches and showed a strong performance. They are currently second behind league leaders Bayern with 30 points in 15 games. Last weekend, Wolfsburg played against newly-promoted Paderborn and took an early lead. The team of coach Dieter Hecking dominated the first half but a lapse in concentration after the break saw Paderborn hit back with the equaliser. In spite of the 1-1 draw, Hecking’s side stays in second place with 6 points ahead against their current rivals Leverkusen and Gladbach. It is a experienced team which is hard to beat and also in the Europa League Wolfsburg managed to reach the next round against Seville. Last season, Wolfsburg won both league games against Dortmund 2-1. Dortmund have had a rough season so far and is favoured to win against Wolfsburg with odds between 1.67 and 1.91. The Wolves have gained lots of confidence in their last games and have odds between 3.70 and 4.40. A draw will pay out odds between 3.50 and 4.03. 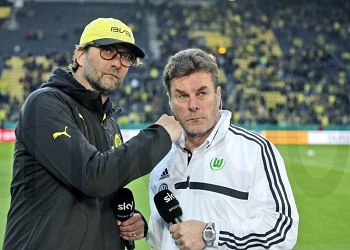 Tip: Even though Dortmund have lots of quality in their squad, Klopp’s side cannot deliver on the pitch and for that reason Wolfsburg are expected to win with maximum odds of 4.40. 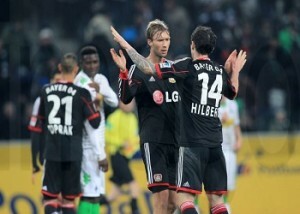 Gladbach played against their rival Leverkusen in the battle for the Champions League spots and had a difficult start. Leverkusen took the lead by Hakan Calhanoglu in the 18th minute. Gladbach tried to stem the tide and find stability. Shortly before half-time break, Roel Brouwers scored the equaliser and in the second half it was a tied game which ended 1-1. With this draw Gladbach climbed in the table and is now in fourth place with 24 points. In spite of a good performance it is necessary for Favre’s side to improve in some positions. Last season, Gladbach won the first game 4-1 and achieved a draw in the return game. Like his counterpart Lucien Favre, Skripnik has also been able to rotate quite a lot of players in the last game against Hannover. Many young players had a good opportunity to play with the first team and show their skills. Hannover took the lead early in the game but Bremen scored the equaliser by Junuzovic before half time. After the break, Bremen scored the 2-1 by youngster Lorenzen, who performed admirably in his first senior game. However, Hannover never gave up and turned the game around with two goals by Joselu and Hiroshi Kiyotake. European Under-19 Football Champion Davie Selke scored the equaliser shortly before the final whistle and the game ended 3-3. In spite of the draw, Bremen are in the drop zone and need a victory against Gladbach in order to leave the relegation spots. Due to the current standings in the Bundesliga table, Gladbach is highly favoured to win against Bremen with odds between 1.40 and 1.50. A Bremen victory will pay out high odds between 5.57 and 8.20 and an excellent value in the maximum odds. A draw will pay out odds between 4.00 and 4.90. Tip: It is true that Gladbach had some difficulties in their most recent games but with maximum odds of 1.50 Gladbach is expected to win. Favre’s side has lots of quality and Bremen are with their backs to the wall. After three wins in a row, Frankfurt played away against Hoffenheim. It was a very open and thrilling game which ended 3-2 for Hoffenheim. It was a tied match in the first half and Hoffenheim scored the first goal by Kevin Volland shortly before half time. After the break, Aigner scored the equaliser for Frankfurt but the deadlock was short-lived as Hoffenheim again took the lead thanks to Adam Szalai. Frankfurt battled and Seferovic who fought hard all evening scored the equaliser by again not giving up and it was unclear which team would leave the pitch as winners. When Firmino scored the 3-2 shortly before the final whistle, Hoffenheim was relieved and earned the three points. Frankfurt lost but they are also confident that they can show a good performance against Hertha Berlin. Last season, Hertha clearly won the first game against Frankfurt 6-1, while Schaaf’s side claimed revenge in the return game with a 1-0 victory. Frankfurt is currently ranked 8th and will climb the table if they win against Hertha. Berlin are strong in their own stadium and played against ailing Dortmund. It was a tied game in the first half until former Dortmund player Julian Schieber took the lead for Berlin with a great solo effort. In the second half, Dortmund was the dominant side and Hertha tried to spark counter attacks. Dortmund created many goal scoring opportunities but were unfortunate not to convert them. With this victory, Hertha climbed to 13th place in the Bundesliga table. It remains to be seen if Berlin can also get the three points against Frankfurt. A Frankfurt victory against Berlin will pay out odds between 2.00 and 2.30. Berlin have gained enough confidence and a win against Frankfurt is possible with odds between 2.93 and 3.45. A draw will pay out odds between 3.20 and 3.63. Tip: In spite of Berlin’s surprise victory over Dortmund, I expect a home victory for Frankfurt with maximum odds of 2.30. Frankfurt are in good shape at the moment and have a strong offensive play. After their last-minute draw against Freiburg, Paderborn faced Europa League participants Wolfsburg. The Wolves are a strong side especially in their own stadium and dominated the game from the very beginning. As a consequence, Wolfsburg scored the first goal and Paderborn was 1-0 down. Paderborn’s defensive player Strohdiek caused a penalty after a foul but Wolfsburg failed to convert it. After the break, Paderborn tried to open the game up but the home team still dominated the game. In the 51st minute there was another penalty but this time for Paderborn and Meha converted it without any problems. Paderborn defended well and managed to secure the 1-1 draw in the 90 minutes. In their next game against Schalke the team of coach Breitenreiter will face a tough test. Schalke recorded three wins in a row and was expected to get another three points against Cologne. Newly-promoted Cologne tried to play defensive and take advantage of counter attacks. After a goalless first half, visitors Cologne dominated after the break as Ujah netted from close in when defender Höwedes failed to clear. Just 20 minutes later Cologne was given a penalty after Höwedes fouled Olkowski in the penalty area and Lehmann converted it to a goal. It is true that youngster Sané scored to pull one back but Schalke could not force an equaliser and Cologne won the game 2-1. Schalke is now under pressure and need the three points against Paderborn. Paderborn is a strong side especially in their own stadium with odds between 2.65 and 3.00. A Schalke victory over Paderborn will pay out odds varying from 2.20 to 2.56. A draw will pay out odds between 3.20 and 3.60. Tip: I expect Schalke to celebrate a narrow victory with maximum odds of 2.56. The team of coach Di Matteo will overcome their recent loss and win because they have the higher quality on the pitch. Hoffenheim celebrated a 3-2 victory over Frankfurt last weekend and climbed to 7th place in the table with 23 points. Hoffenheim had the better start and netted in twice but Frankfurt found the right answer and scored the equaliser. Hoffenheim’s key player Firmino was man of the match as he scored the winner shortly before the final whistle blew. However, Hoffenheim paid a high price for the victory: Niklas Suele will be out of action for the rest of the season due to a knee injury. Suele suffered an anterior cruciate ligament rupture in his left knee during Saturday’s 3-2 win over Frankfurt in the German Bundesliga. Last season, Leverkusen won the first game 2-1 and Hoffenheim won the return game 3-2. It remains to be seen which team will leave the pitch as winners after 90 minutes of play. After their defeat against league leaders Bayern Munich, Leverkusen were eager to win against Gladbach and dominated the game from the beginning. In the 18th minute Calhanoglu gave the hosts the lead with a fine strike but Gladbach didn’t give up and Brouwers netted the equaliser, and though both sides had chances to take maximum points, they ended the day the way they had started it: locked together on the same number of points, with Bayer a place ahead in the standings. With a victory over Hoffenheim, Leverkusen would be able to put pressure on second-placed Wolfsburg and narrow the gap to Bayern. The question is how coach Roger Schmidt will line up his team against Hoffenheim and rotations are always an option. Hoffenheim are considered to be the outsiders against Leverkusen with odds between 3.00 and 3.45. A draw will pay out odds between 3.30 and 3.75. A Leverkusen victory over Hoffenheim will pay out odds varying from 2.00 to 2.21. Tip: Both teams are in an almost equal shape at the moment and it is difficult to pick a winner ahead of the game. For that reason I expect a draw with best odds of 3.75. Here you find the overview of the matches of Wednesday with the comparison of the bettingodds. This entry was posted in Bundesliga and tagged bettingodds bundesliga, borussia dortmund, bundesliga betting, bundesliga wednesday. Bookmark the permalink.